Renown Plastic Surgeon Dr. Raffi Hovsepian Performs Live Surgery at the World Premier Education Conference of the Year: Facial Rejuvenation 2016 – Master the Techniques. Dr. Raffi Hovsepian has been invited by The Educational and Research Foundation for the American Academy of Facial Plastic and Reconstructive Surgery (AAFPRS Foundation) to be involved with colleague, co-director of the annual Facial Rejuvenation Meeting, and operating surgeon Dr. Rami Batniji on a live surgery on Friday March 18th 2016. The AAFPRS Foundation is accredited by ACCME (Accreditation Council for Continuing Medical Education) to sponsor continuing medical education for physicians. The event will be held from Dr. Hovsepian’s office and broadcasted live for continuing medical education of medical students, residents, fellows, and practicing physicians in the field of facial plastic and reconstructive surgery. 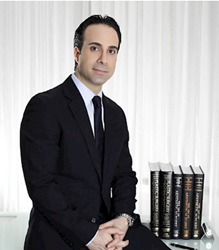 Dr. Raffi Hovsepian has many achievements in aesthetic, plastic and reconstructive surgery. He consistently provides his patients with top-level care by implementing the latest innovations in the field. In speaking of his performing this live surgery with Dr. Rami Batniji, Dr. Raffi says, "It's an honor to be asked by the AAFPRS and colleague, Dr. Batniji, to be involved in this live surgery for educational purposes and is a great affirmation of my efforts and the years of education I’ve invested to become the surgeon I am today. I am proud of these efforts and strive to pass along my knowledge to my colleagues and to the future generation of Plastic and Reconstructive Surgery." Dr. Hovsepian has also co-authored and edited elite books and journal articles in his field. Dr. Raffi Hovsepian's professional achievements, full patient satisfaction and numerous awards demonstrate his incredible capabilities as a physician. Dr. Raffi Hovsepian is a triple board certified plastic and aesthetic surgeon. He has been a recipient of many awards, including Top Doctor 2016 by Castle Connolly Medical Ltd, 2000 Outstanding Intellectuals of the 21st Century Award and Top Doctor 2016 by Los Angeles Magazine. He has also been indoctrinated into the American Board of Medical Specialties, an achievement accomplished by only a handful of surgeons. Dr. Raffi Hovsepian graduated medical school with a Doctor of Medicine and two Master's degrees in Science, and Pathology and Physiology—all while remaining in the top 10% of his class. He graduated as Chief Resident in general surgery at the University of Nevada School of Medicine. After his residency, he completed a fellowship at the Aesthetic & Plastic Surgery Institute at the UC, Irvine School of Medicine. Dr. Hovsepian currently resides in Beverly Hills, California, but also owns international practices in Brazil and Greece so he can serve clients that live all over the world.